As my brother watched the kids open their Christmas presents, he was totally eying the bookplate stamps that I'd carved for each of them. So I decided to make one for him, snapping some tutorial pictures along the way. Carving these took between 30 minutes and an hour each (30 for the text, 30 for the scalloped edging). And each one cost about a buck for materials. The carving tool was less than 10 dollars and it's been a fantastic investment (considering we've already used it to carve some awesome Stephen King pumpkins). 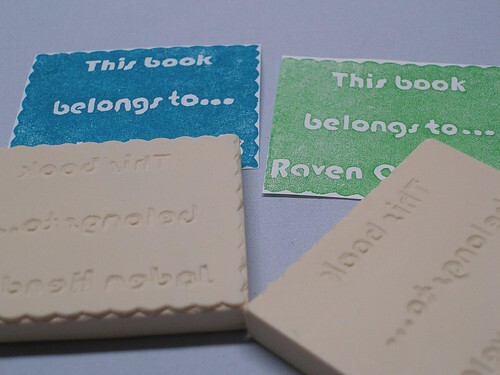 -You can cut the block in half, which produces two smaller stamps that will be more likely to fit all books. Always use a cutting mat or a very thick piece of cardboard underneath. Try to keep the blade perpendicular to the cutting mat otherwise it can go a bit wonky. -The edging can be as fancy or as plain as you'd like. For the simple straight lines on Matt's, I just used tape as a guide. -Create a word file the same size as your stamp. It should look exactly like you want it to appear when you stamp, not a mirror image. I created a rectangle that was 2.75" x 2.25" (the exact size of the stamp) to help line it up later. Bauhaus 93 was a pretty easy font for me to carve. -Transfer the image to the stamp. Make sure your printer is not out of ink because it will significantly lighten the transfer. Clear a flat, hard surface near to your printer to work on. Put a few pieces of double stick tape on the front side of the stamp. Print the document, lay it face up and then immediately turn the stamp over onto it, lining it up with the printed rectangle. 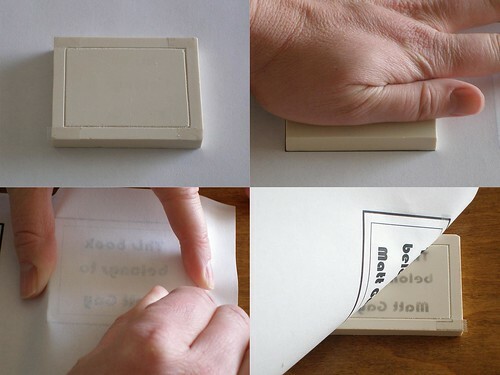 Flip it over and rub the back of the paper with the back of your fingernail (or spoon). Peel up carefully. The writing will automatically be a mirror image, which is what you want. If for some reason it's crooked or badly smeared, you can just wash the stamp with soap and water, let dry and then give it another shot. Slowly and carefully, carve out the words. -These carving blocks tend to be a bit crumbly. 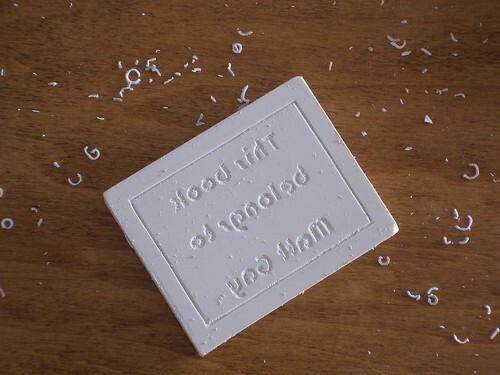 After you're done carving, gently scrubbing it with a clean toothbrush will give it a nice smooth surface. 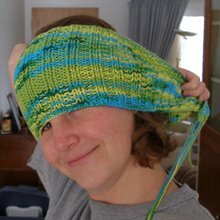 As with any of my craft projects, I'd love to see your versions if you give them a try. Also, be sure to come back next week for more of the Book Gift Set, complete with a tutorial for the personalized library bags. This is AWESOME!!! Thanks so much for sharing the how-to for this fabulous project. What a great gift idea! I'll be linking. So groooooooooooooovy! Thanks for the tute, toots. I love this. I especially love the little gift set that you've put together at the bottom of the post. Really cute idea. Thank you for sharing. That is so freaking awesome. If I didn't have arthritis I'd make one that says "WOLVERINES!" Or "This book is filled with anthrax". That way no one would steal my books unless it was worth the risk of anthrax, in which case they could totally have the book. Unless they thought I was talking about the band "anthrax". Then I'd just have to put a little notation that says "the poison...not the band". Then I'd run out of room. This is why I don't carve bookplates. Amazing oprject and looks super easy! Just found some leftover Easy Cut. Hopping on this. Thanks for the idea!!!! What a great idea for Christmas presents along with a book. Thank you so much for sharing this. This is WONDERFUL!!!! My son is an avid reader, spending more time at the library and the bookstores than any other place (thank goodness) ... and this is a PERFECT gift for him. Thank you so much for sharing this tutorial. This is a good idea. As a teacher I am always in need of a stamp that says postive things or please fix this notes. And I have tons of books! When I have some free time (if is more like it) I'll try to make a stamp or two. Thanks for the info.